We’d love your help. 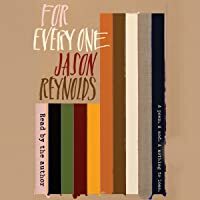 Let us know what’s wrong with this preview of For Every One by Jason Reynolds. For Every One is just that: for every one. For every one person Originally performed at the Kennedy Center for the unveiling of the Martin Luther King Jr. Memorial, and later as a tribute to Walter Dean Myers, this stirring and inspirational poem is New York Times bestselling author and National Book Award finalist Jason Reynolds’s rallying cry to the dreamers of the world. To ask other readers questions about For Every One, please sign up. I saw this in the Goodreads Choice Award nominations for Best Poetry and thought I'd check it out! It's a super quick read - thirty minutes max. - but it's pretty hard-hitting without being cheesy. That's the one reason I can never get into "motivational" reads: it's almost always super cheesy, carpe diem-type stuff. Reynolds, however, doesn't truss it up. His raw and sparse poetry is to the point and unsentimental. Moments like this one are occasional centre pieces, not the foundation of the poe I saw this in the Goodreads Choice Award nominations for Best Poetry and thought I'd check it out! Which make them more meaningful and less irksome when they do appear. I enjoyed it. It's a sweet - but not too sweet - letter to those out there working on a dream, no matter their age or circumstances. More than a "you can do it", it is best described as a "I'm trying to do it like you're trying to do it; maybe I'm going to fail; maybe you're going to fail; let's keep trying and failing together". And I think there's something heart-warming in that. Simply inspiring! 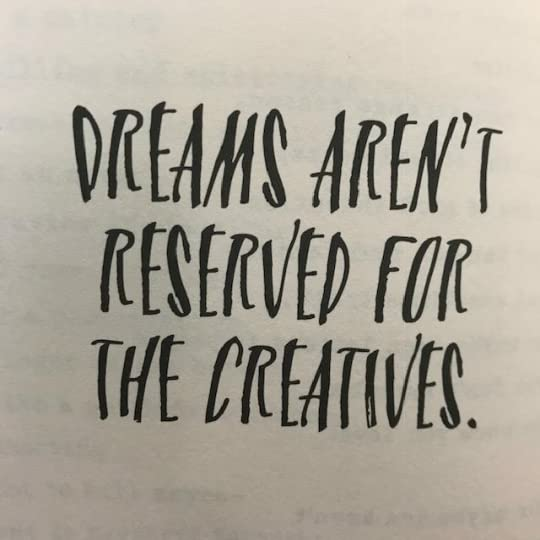 Jason Reynolds is quickly becoming a favorite author of mine. I'm a simple woman: I see anything by Jason Reynolds, I pounce on it. This is a poem/letter for "dreamers" in the world. It's as much of testament of Reynolds' trials and errors as much as it is a call-to-action for the readers. The writing style is very clean and this probably only took me 10 minutes to read because it's barely over 100 pages and it's designed in a neat format on the page that plays around with font and spacing. Jason Reynolds is an author I've been meaning to read for a while now. Usually I am not one for poetry but I've been trying to set aside my prejudices of it lately. Reynolds delivers a powerful letter, one that speaks to all kinds of readers. I really enjoyed this small book, it took about 20 minutes to read and I found myself reading slower to savor the words. Originally performed at the Kennedy Center for the unveiling of the Martin Luther King Jr. Memorial, and later as a tribute to Walter Dean Myers, this short speech by great performer and children’s author Reynolds is vaguely titled, but it is addressed to young people about the importance of dreams. In it the now successful Reynolds reveals how he was unsuccessful most of his life, and never gave up. His principal accomplishment seems to be the fact that he is an inspiration to thousands of kids Originally performed at the Kennedy Center for the unveiling of the Martin Luther King Jr. Memorial, and later as a tribute to Walter Dean Myers, this short speech by great performer and children’s author Reynolds is vaguely titled, but it is addressed to young people about the importance of dreams. In it the now successful Reynolds reveals how he was unsuccessful most of his life, and never gave up. His principal accomplishment seems to be the fact that he is an inspiration to thousands of kids. He seems to be one who has taken up the torch held by Walter Dean Myers. A quick read of an inspirational poem aimed at younger readers, exhorting them to dream, to have courage, and to take action. The words, while not groundbreaking, are heartfelt, and I would have liked to have read the sentiments when I was much younger and wondering what direction I should go. or as close as lunchtime. I read Long Way Down by Jason Reynolds this year and absolutely loved it. I'm not a fan of self help books. But this was nominated for best poetry in the in the Goodreads Choice Awards and I wanted to read more of Jason Reynolds. There's something very magical about the way he writes. It's art. This letter to a dreamer is so short yet hard hitting. There's so much meaning and so much feeling behind this. It's beautiful. This book is For Every One! Beautiful. Everyone would benefit from reading this letter/poem of dreaming and jumping and persisting and accepting. Jason Reynolds, I love you. The basic theme is to go for your dreams NO MATTER WHAT AND HOW OLD YOU ARE. I so needed to read something like this. And hellaluyah! I got this at the perfect time. The lines are so pure and so damn motivating. There's no turning back when you pick up this one. 3.5 stars! I don't usually read this kind of books, but it was not bad at all. I enjoyed it. This book was more of a short, quick read for me. Yet it was a fast read it was also a little hard to understand at times only because there wasn't much of a story to it. In which there wasn't a lot to the book. It was inspirational because it was almost like a book filled with small notes that were encouraging. I liked this book as a quick read because normally I tend to read books that take a lot longer to finish and so it was good to switch it up. Every time I think I can’t love him more than I already do, Jason Reynolds makes me love him more than I already do. I want to read this book/letter/poem to every single one of my students—past and present— read it out loud to myself every day, read it from a loud speaker as I drive down the road, read it everywhere to everyone. This book is for every one. This poem/letter came along at exactly the time I needed to read it. I had been through a rough few weeks, and this was just… everything I needed to keep me going. (Once again, Jason Reynolds saves the day.) But seriously, this was a fantastic poem I think everyone would benefit from reading. Reynolds’s poetry is so m This review originally appeared on Novel Ink. A letter of encouragement for dreamers, and for anyone thinking of giving up on a dream. A letter to himself. A letter to the dreamers. Jason Reynolds setting words on fire...per usual. This would be the kind of book you gift young people graduating. The takeaway of ~take the leap~ is one I think coming from someone like Reynolds really works well. The design of the book is also super appealing, and I can see readers coming back to this one again and again. Never give up on your dreams. I highly recommend as read by the author, it's an incredibly powerful yet short listen. It’s real. It’s quick. And it’s worth the time. When life gives you lemons, read Jason Reynolds. Lord, this man! This poetic letter to every one is for everyone. The dreamers. The doubters. The hijacked. The prospered. Those afraid. Those with courage. The jumpers. Whichever you are...JUMP. I want to curl up in these words, share them, and live them. Jason speaks so honestly in For Every One; “I have yet to see my own dream made tangible.” He speaks to the dreamers and to not give up. But it’s more than that. Everyone sets these preplanned goals for themselves such as, “By this age, I will have accomplished this much” and when you don’t accomplish that, you feel like a failure. Jason let’s us know that isn’t the case. You can’t compare yourself to somebody else’s goals or accomplishments. You can only compare yourself to you. There is no right or wrong way, no age limit, nothing stopping you from achieving your dream but your own self doubt. This piece is so inspirational I’m tempted to quote every other line – but that would defeat the purpose of you experiencing this for yourself. The language he uses is so raw and real. He uses colloquial speech – he isn’t using big fancy words. He’s using words we all hear in speak in our everyday life, if you’re rich or poor, black or white or somewhere in between – everyone can understand his words. That’s one of the things I love about Jason’s writing – it’s easy to understand, but the way he weaves the words together and makes metaphors – wow. It hits you. You never realized how powerful words could be. This is the third piece I’m reading that Jason Reynolds has written and I will officially read anything and everything this man writes from now until forever. I am in love with his writing and if you have never read anything by Jason Reynolds, please do yourself a favor and pick something up – I’ve read For Every One, Long Way Down, and All American Boys – highly recommend ALL of those! If you’re feeling like you will never accomplish your dreams – give this a read or listen. Listen to Jason’s words. They will give you hope you didn’t know you had. The audiobook has an extended excerpt of Jason speaking about writing this and how it was almost a bow out to himself – saying, you tried, but you failed. For Every One é uma carta sobre sonhos e como alcança-los; mas sem fórmula mágica, sem receita, sem planejamento. Sonhos são sonhos e todo mundo tem, independente de quem é, do que faz ou do que quer fazer. Se você tem 30min no seu dia, escute For Every One e respire fundo. Jason Reynolds é, na minha opinião, um dos melhores autores da atualidade. A short, yet powerful read to never give up on your dreams! Jason Reynolds has a way with words. This book will make you realize that on the road less traveled, you're not alone. On the dreams you feel as though have passed you by, really haven't. No matter the fear, the obstacle etc, JUST JUMP! This book makes the perfect gift. It's the motivational speech that everyone needs.